The next generation TallyGenicom 6600 line matrix printers transform product innovations into the Power of Plus Seamless integration into your current workflow will enable you to reap the benefits from the improved reliability, productivity and environmental advantages. The 6600 family is available in a choice of printing speeds, including 500, 1000, 1500 and 2000 lines per minute. All models in the 6600 family are ENERGY STAR qualified and are fully compatible, direct replacements for earlier TallyGenicom printers. The total cost of ownership has been dramatically improved through a 30% reduction in consumable cost per page. Together, these innovations present a compelling reason to upgrade your printing solution to the TallyGenicom 6600 family. Looking for Tally 6600 Series Parts? The 6600 Open Pedestal is the dependable workhorse line matrix printer that forms the foundation of the 6600 Series. It is presented in a small footprint with the convenience of either top tear or rear feed and can be accessorized with a front tray and two different rear trays. Like all the printers in the 6600 family, the open pedestal is ENERGY STAR qualified and is ready to plug into your network and start printing from day one. The 6600Q Cabinet is the quiet choice in our mission-critical line matrix printer line-up. It is perfect for those who work in noise sensitive areas and need direct access to a quiet industrial strength printer. This is the top-of-the-line printer in the 6600 family, configured in a fully enclosed sound reduction cabinet with access from the front, top and rear. Innovative options can customize the 6600Q for your printing needs. The 6600Z Zero Tear is the specialized line matrix printer choice for customers using multi-part and serialized documents that require single form tear-off usability. The 6600Z is the perfect choice to minimize waste of forms such as pre-printed tickets. Through its unique tractor configuration, the 6600Z pushes pre-printed media through the hammer bank, eliminating waste of valuable forms. 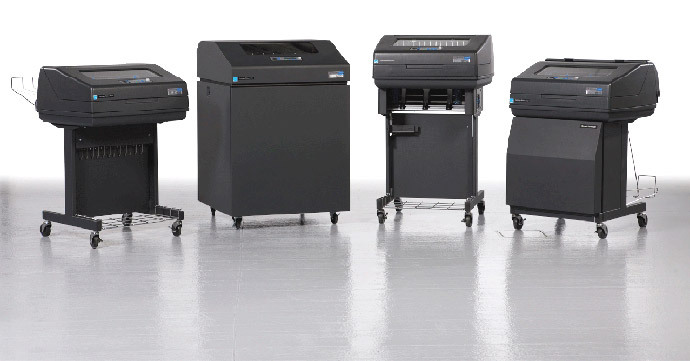 The 6600 Quiet Pedestal comes equipped with all the built-in quality, reliability and performance of the top-of-the-line TallyGenicom 6600Q Cabinet printer, in a smaller and more compact footprint. It is the perfect line matrix printer solution for customers looking for a quiet, versatile, dependable, pedestal-style printer for use in an office with space limitations. ENERGY STAR qualified, lower consumable materials and packaging, improved handling of recycled paper, faster power-up from sleep mode than laser printers.